Upon returning to my blog after a summer of hiatus (I’m trying not to feel guilty.. haha), I realized that my last post in June perfectly connects to my main topic tonight. In summary, I talked about trying to bring passion into my prep subjects I teach in the afternoon by building relationships with students and taking time to get to know them amidst the somewhat controlled chaos that is “teaching out of a cart” (although the cart, in my case, is merely metaphorical, and not literal). And now on to my main topic (thanks for sticking with me through the preamble)… It must be the gloomy, rainy weather (heads up, I’m going to be honest and vulnerable here), because I came home tonight feeling deflated. After an amazing ECE conference this summer, I am feeling more passionate and willing to try new things in the Pre-K half of my job than ever! However, my prep subjects were getting me down. I became a teacher because it is my passion, my vocation, my calling and I couldn’t shake the feeling that teaching prep subjects, jumping from classroom to classroom, and attempting to build meaningful relationships (and expectations) with 100+ kids was an overwhelmingly insurmountable task that did not bring me that passion. I couldn’t help jump on the pity train and count off the reasons why my prep subjects were the source of all my problems. After some wallowing, though, I started to ask myself what I could do to help bring my passion into these subjects… and I came up with a plan. I love Pre-K so much because it is the optimal learning environment: each student is consumed in learning that is MEANINGFUL and FUN for them. There is no teacher at the front of the room, droning on, telling students what to learn or how they will learn it. Students are co-creating knowledge and determining the direction that the learning will take. Now, if only I could bring that kind of learning environment into my upper elementary classes… Oh wait, I can! (and wouldn’t you know it, by some stroke of fate, “developing more student-driven teaching practices” is my Professional Development Goal this year). So, I think, starting next week, I will be scrapping MY plans and have a serious discussion with students about them taking charge of learning that they are interested in. Think Genius Hour meets emergent curriculum meets inquiry project? Gulp. If it sounds scary to you, it’s even more scary (albeit exciting!) to me – as a meticulous planner and ‘thrives off of organization’ type. But, if it gets the students excited about learning, then it gets me excited about teaching them helping them discover curriculum for themselves. In closing, I want to acknowledge that my younger sister is currently going into her pre-internship year the U of R (my alma mater <3). Seeing how excited she is, and thinking back to when I was just a pre-intern, is what pushes me to continue growing and finding passion in my practice. I would hate to disappoint pre-intern Kara by griping about my job (which, really does rock). What brings you passion in your teaching? How do you make learning meaningful for students? Have you done inquiry/emergent curriculum/Genius Hour with your students? Tell me about it! Well, my teaching tribe, wish me luck! Today marked my fourth day of internship! Take a look at what I’ve been up to thus far! 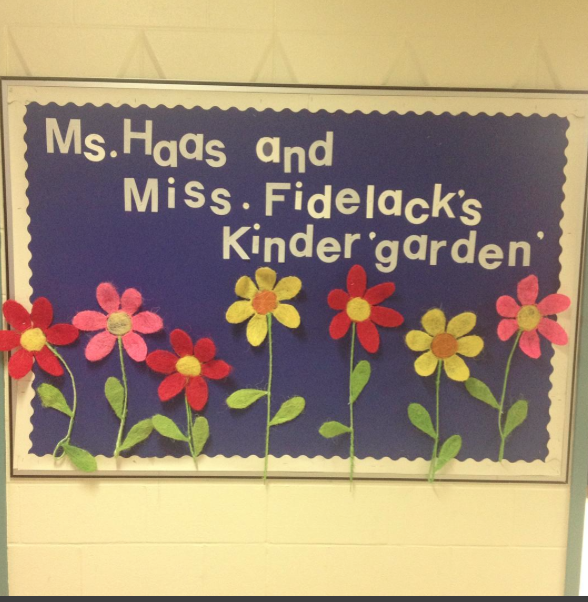 My co-op and I arrived at the school early to get a start on bulletin boards. I whipped up the one below fairly quickly once I got the hang of it (it helped that my co-op had all of the materials ready to go – can’t take all of the credit haha). We also had a meeting with the entire school staff to go over the teacher ‘handbook.’ It was a bit overwhelming at first with all of the new faces and information. I think I’ve got everyone down now, though! It helped that there was a staff BBQ at the principal’s house that evening to continue to put faces to names (and the delicious food was an added bonus). A classic welcome back to school bulletin board, complete with a play on words. It was off to Rosetown (the Sun West School Division’s central point and location of the division office) bright and early for iLearn – the division Professional Development day. Car pooling was a great way to get to know some of the staff better. I attended some great sessions geared towards Kindergarten and ECE, the first being Project Approach in the ECE Classroom and Phonological Awareness. Both inspired me to try some new things in K these next four months – my list of internship goals is rapidly growing, so I will attempt to squeeze as much in as I can! Off to Rosetown for Teachers’ Convention – Day 1! We had an engaging keynote from a Hoop Dancer that I really enjoyed. I also attended an STF 101 session and a collaborative session on teaching gymnastics to elementary students. Today was our final drive to Rosetown for the second day of convention. Brain Breaks was a very informative and useful session that provided a wealth of ideas to get students moving. Next, I attended a session on Work/Life Balance, which should prove useful as I head into a busy semester of student teaching! New to convention this year was an afternoon of Ed Camp, where teachers can suggest sessions they would like to facilitate on topics of their choosing. I went to the Kindergarten session, wherein we chatted about EYE assessments (which I will get to see first-hand this semester) and new report card procedure changes (K will be switching to numbered report card scores this year). My final session of the day was a last minute choice, but extremely worthwhile. It focused on the app Seesaw, which is an interface for the creation of digital portfolios. My co-op and I were both instantly impressed and wowed, and I am excited to say that we set up both of our Kindergarten classes on Seesaw on the drive home! I have not learned a new educational technology in a while, so I am excited to have a ‘project’ that my co-op and I can learn together with the students. I will make a post soon solely on Seesaw and its features. This week has been jam-packed and (not surprisingly) tiring! While it has been great getting to know staff in my school and division, I have found this week a test of my patience, as I really just want to meet all of my new students and dive into teaching! The students start on Tuesday, so my wait is not much longer. I’ll be sure to post again soon about my first days with the students and my Seesaw experience. Today, my classmates and I went on a tour through the Mackenzie Art Gallery’s newest exhibition, Moving Forward Never Forgetting (which was phenomenal and I highly recommend everyone go check out). 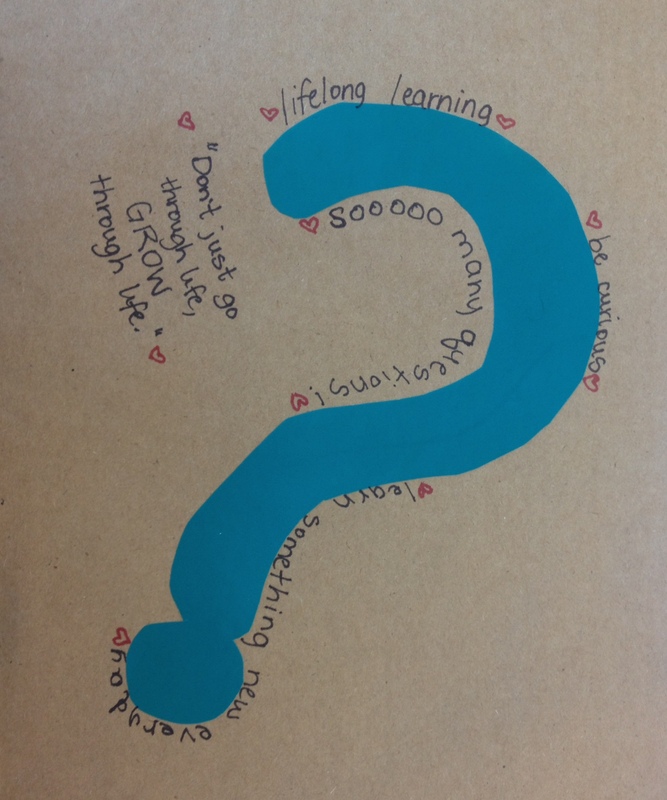 During some hands-on experience of making art, we were each asked to “draw a symbol that represents you in this moment.” Instantly, I decided upon a question mark, and it seemed very fitting. This year (and semester) has been a time of great learning and growing for me. But it seems the more I learn, the more I realize I don’t know. When I was in high school, a teacher whose classroom I volunteered in told me, “You could walk into a classroom tomorrow and be a teacher.” And I thought, “Yeah, I could!” Now that I am three years into my degree, I think, “No! I am not ready! I could go to school for three more years and not be ready!” It just goes to show you how complex a job teaching truly is, and that having your B.Ed. only begins to prepare you for being an educator; you do so much more learning when you actually ARE a teacher. So while I may still have so many questions and things I want to learn (especially with my three week block coming up – countdown is at 11 days! ), I am in one of the best professions to continue to be a lifelong learner alongside my students. I was clicking through my blog today and found myself wishing I had something to write about. Then, this little tidbit just happened to fall into my lap. And here I am, in my glory, blogging. Happy to be back! My sister is in her Grade 12 year and is hoping to also come to the University of Regina to take Elementary Education (she has good taste, don’t you think?). She is starting to think about university applications and has asked me for some guidance through the process, as I have actually experienced this before (albeit a few years ago – wow, they flew by!). What makes a good teacher: what are the skills, traits and characteristics possessed by a good teacher and why these? The traits that one must possess in order to be a good teacher seem rather obvious, don’t they? Ask a Grade one student and they can easily tell you that teachers need to be patient, kind and helpful. Even though they are young, that student would be 100% right. Everyone knows that teachers require organization, creativity and a love for kids. However, instead of these more obvious characteristics, I will go over some less often thought of attributes. Teachers need to be adaptable. Every student has their own way of learning and if a teacher is open to trying new techniques, they can ensure they are meeting every student’s needs. Not only do teachers need to be flexible regarding their lessons, they have to be able to fill different roles. Depending on the situation, a teacher may have to play the part of a friend, disciplinarian, nurse, referee, janitor or entertainer. A good teacher is not just a teacher. Kids need their learning environments to not only be educational, but also creative and fun. This is why teachers need to be a child at heart. Besides allowing them to relate to their students, it is the key to being able to keep up with the nonstop activity of an elementary classroom. An energetic and ambitious teacher has the ability to inspire a classroom full of students to have a lifelong positive attitude towards education. Teachers must have appreciation of ‘the little things.’ To most people, a crayon drawing isn’t anything spectacular, but in the eyes of a teacher, it shows potential and imagination. Teachers praise students every little step of the way. The joy of a moment when a student finally grasps a new concept is unlike any other. Perhaps the quality I admire most, however, is the genuine passion that teachers have for not only their craft, but also for the students that they are involved with every day. The teachers that stand out most in my mind are those who truly care about their students. This is the kind of teacher that I strive to be one day. I have learned so much during my time at the University of Regina, and I often forget exactly what I thought it meant to be a teacher at the beginning of my degree. This little peek into my pre-university opinions of education are quite a little treat! If I had to rewrite this essay today, I’m sure it would include some education jargon and qualities like equitable, inclusive, and accepting of diversity. But the merit of what I wrote 3 years ago (THREE?!?! THREE!!!) cannot be overlooked, either. I still think it is true that good teachers should be adaptable (to student learning styles and abilities – differentiation, differentiation, differentiation! See what I mean about education jargon? ), children at heart, appreciative of little things, and passionate.